Formerly Ki-em Art House, the newly named hotel still has the cool French-flair of the original Vietnamese-French artist who built it. This is a beautiful, artful little sanctuary that blends contemporary design with traditional Vietnamese motifs. It has just eight cottage-style rooms situated in a garden and two overlooking the sea. The garden rooms are spacious and airy as white walls soar up to vaulted ceilings and terracotta floors give the space some earthiness. It does lean towards a clinical feeling as accents are monochrome and wood furniture is minimal in design, with hard, clean lines. The bathrooms are a disappointment: They’re a narrow tiled box with stone floors, but they do the job. The garden rooms do feel oddly removed from the star feature: the beach itself. The restaurant and common space are closer to the ocean but it is still a walk down to the sand. The lofty lounge area feels like an art gallery as the space is filled with bold artwork, gorgeous timber furniture, high-end tableware and playful vibrant colours. The resort even has a small temple shrine, swimming pool in the garden and a gallery/museum in a traditional Vietnamese building. As the name suggests, you are signing up for silence. The resort is a quiet place – too quiet for some. It’s a sharp contrast it to the lively communal atmosphere next door at Paradise. But this is the most refined and upscale accommodation on Doc Let and if you are looking for a sanctuary of silence, this is the place. Check rates at Some Days of Silence on Booking.com. 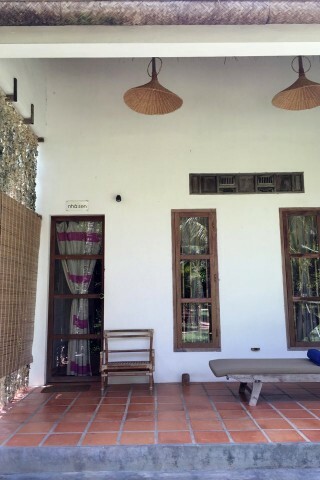 Room: Standard double room, low season: US$70, high season US$110. Notes: Garden view. Room: Superior double room, low season: US$100, high season US$140. Notes: Sea view. Room: Family room, low season: US$130, high season US$180. Notes: Three people.